Adapted from the article “Diagnosing and Managing Branch Wilt Disease” by Janine Hasey, UCCE Farm Advisor, Sutter, Yuba, Colusa Counties in the October 2012 Sacramento Valley Walnut News. Hot weather favors the fungal disease Branch Wilt (Nattrassia mangiferae, formerly Hendersonula toruloidea). 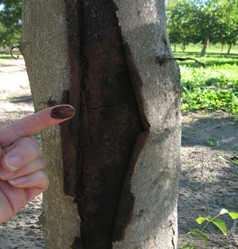 Below are the main points you need to know to recognize and manage this walnut disease. Photo 1. First symptom: sudden leaf browning of the outermost branches. Photo: J. Hasey. 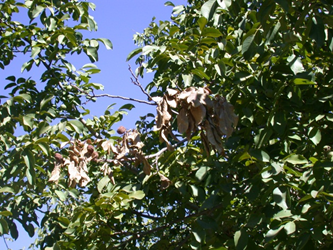 Typically in July and August after a hot spell, the first symptom of branch wilt is yellowing and browning of the outermost branches usually on the southwest exposure of the tree (Photo 1). Next, the leaves suddenly wither and turn brown on the infected larger limbs and remain attached to the twigs even after leaf fall, making diseased trees easy to spot in the fall. Photo 2. Outer peeling bark and black sooty spores. Photo: J. Hasey. The thin outer layer of the walnut bark will peel away, revealing black sooty fungal spores (Photo 2). The fungus kills both the bark and the wood of infected limbs. Look for gray to black discoloration extending to the center of the branch in the shape of a cylinder or partial cylinder (Photo 3). The disease will progress killing large branches if left unchecked for a period of years, eventually even extending into the trunk (Photo 4). Photo 3. 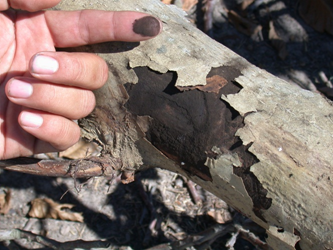 Gray to black discoloration extending to the center of the branch. Photo: J. Hasey. Frequently branches killed by branch wilt are colonized by Botryosphaeria species (Bot). Bot may be misdiagnosed as branch wilt because both diseases cause branch dieback. See here for photos of Bot-caused branch dieback. Photo 4. Branch wilt can extend into trunk if left unchecked for several years. Photo: J. Hasey. The Branch Wilt fungus can only invade bark that is split, frost damaged, or sunburned (the most common entry). Black sooty spores that can survive for long periods under hot dry conditions are spread by wind or rain throughout the year. The disease, however, can only develop under warm temperatures growing best at 90oF. The southwest side of the tree is the most likely place to find branch wilt because of a higher frequency of sunburn injury. 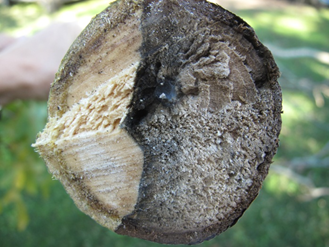 Trees weakened by a disease such as deep bark canker common on Hartley, crown rot, water stress, nutritional deficiencies or low vigor, are more susceptible to sunburn injury and subsequent infection by the branch wilt spores. Prevent sunburn by maintaining vigorous canopies through proper irrigation, fertilization, pruning, and pest control. Look for branch wilt symptoms annually right after harvest while there are still healthy leaves on trees. Remove diseased limbs, cutting back to a lateral branch into healthy wood that shows no discoloration. Pruning does not spread infections so there is no need to sterilize equipment between cuts. Burn all infested wood.